The clock always ticks, sometimes slow, sometimes fast, but it always ticks as soon as the last sliver of the Looksha’s yellow hull disappears from my sight. It ticks as I enter a grocery store or look at a restaurant menu, as I fill water bottles or send emails from a library, as I walk to a post office on main street or a gas station along a highway. It ticks, it always ticks because I know that every moment away is a chance that I will never see her again. A white piece of paper taped to a restaurant door in New Madrid made the clock tick faster than ever. I felt every word like I’d written it myself. It is a desperate plea, not so much for a boat, but for the return of a dream that someone stole. I read it twice, then walked to the street and looked back toward the museum where I’d left the Looksha, just to check, just wanting to see a bit of her yellow on the green grass. But that white piece of paper said otherwise and I needed to check, just in case, just so I could eat fried catfish and hush puppies without my stomach turning knots. Today, fifty miles down the river in Caruthersville, Missouri, that paper still hung in my mind and I needed food, water, and, if I could find it, half a gallon of ice cream. I left the boat at an old ferry ramp that no one uses for anything but an occasional campfire down by the river. There’s a gas station just a quarter-mile away over the levee and on a Sunday morning, the ramp felt deserted and safe. But the clock still ticked as I walked. It always ticks. The gas station was half restaurant and just as I realized they didn’t have half-gallons of ice cream an old called me over to his booth. “You going down the river?” he asked. He read it like I had a billboard over me and I wondered how he knew. More than that, I wondered who else knew. I looked around the store. People walked in and out, trucks pulled out of the parking lot. He told he’d met all kinds going down the river. Stories started to come out. Questions about the trip. Claims that he’d been to the Angle, that the army posted him near Brainerd way back when. Then one of his buddies mentioned the stolen canoe in New Madrid. The man leaned back in his booth. That clock spun like mad even though I knew no one would be on that old ferry ramp, not on a Sunday morning. I bought water, some sandwiches, two bags of chips and walked fast toward the boat. Then I saw another gas station and thought maybe, maybe they have a half-gallon of ice cream, maybe I can spare a few more minutes. It’s an old tradition from the Appalachian Trail. At the halfway point, you eat a half-gallon of ice cream. I think it’s lucky and I’ve done it on every trip since, but when I got to Cairo, which seemed as good a halfway point as any, 40 degree temperatures and a town two miles up the Ohio River convinced me to wait. In New Madrid, I couldn’t find a half-gallon to buy. “They gotta have ice cream,” I thought. I checked the clock in my head and decided to risk it. Ten minutes later, I walked back down that old ferry road with two tubs of ice cream, 1.5 quarts each, a bit more than a half-gallon, but sometimes you have to make do with a little math. The road felt as abandoned as ever, nothing but a muddy track through the woods along the levee. I looked down toward the water and there was the Looksha, just as I’d left her, bright yellow in the sun. No one would be there on a Sunday morning. I drifted away, eating spoonfuls of ice cream, and enjoying the silence of a stopped clock. Posted in Angle to Key WestTagged Angle to Key West, appalachian trail, half-gallon challenge, halfway point, ice cream, stolen boat, traditionsBookmark the permalink. Ok! Got that ice cream an no one stole your transportation. A good day. Well said. I can offer you secure safe haven for couple days while in Memphis area. My references are Dave Cornthwait, Rod Wellington, Mark Kalch and John Rusky – all have stayed here. Know several of the folks up river you have met along the way. Also on Face Book – Dale Sanders – believe we are friends already. Also, if you have time, check out my site at: http://www.dalesanders.zenfolio.com. Cell: 901-628-8686 or home 901-382-0401. 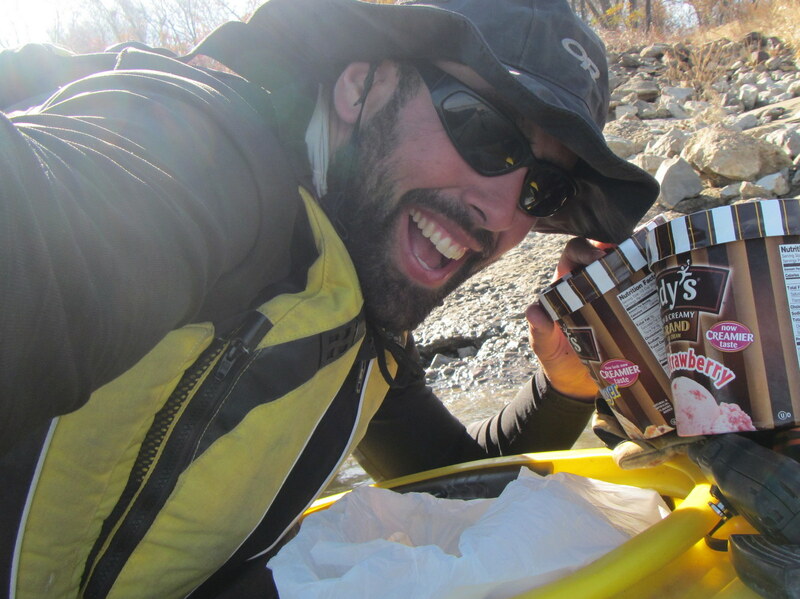 It is written, “The Ice Cream Goddesses always protect your vessel.” Your stomach is another story — good luck Wally.